The chimney is a channel of round or rectangular cross-section, intended for removal of gaseous products of combustion of fuel (gas, coal, wood and liquid petroleum products). Of tightness and thermal chimney depends on the quality of the heating equipment in your home, its safety and appearance. At the present time, when used as a fuel gas is increasingly popular is cost-boilers. What do you mean cost? This means that they use the energy of the combustion gas only for heating water in a heat exchanger to a predetermined temperature. And do not spend it (energy) to warm up the chimney, as in "ancient" instruments. Earlier in the "beneficial effect" in the calculation of Efficiency included the volume of gas intended to maintain the temperature 140 degrees on the boundary chimney and atmosfery.Dlya what? In order to avoid condensation of water vapor in the chimney. Hence the "inflated" at first glance Efficiency (120% - 135%) of some sverhekonomichnyh boilers. The flue gas in some of them dropped to 70 ..! In turn, these savings were placing increased demands on a modern chimney. Because the chimneys of the old type do not stand (wet, crack and break). Also today a great popularity began to use fireplaces and saunas, which is used as fuel wood. Estesstvenno for these devices can be used chimneys "ancient" type. But you can compare them with modern ones. 1. Chimney with a circular cross section has a lower smoke resistance. 2. Chimney with smooth inner walls are much less soot accumulates. 3. 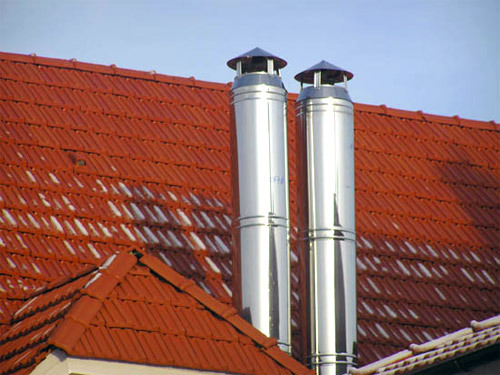 Insulated metal chimney from the inner surface warms up quickly, and this means that there will be fewer problems with fire is lit in a cold-damp time of year. 4. Today's most popular hearth-type sauna HARVI, SASTOR, NARVI, practically not suitable for direct connection to the brick chimney. 5. The cost of the refractory brick chimney above the cost of the chimney of stainless steel. Europe has long been using stainless steel flues. We, in Ukraine, this industry is young, but already successfully developed. Moreover, production of domestic firms - manufacturers of chimney more than popular. Not yielding to the reliability and durability of foreign and Ukrainian chimneys cheaper. Taking the above - stainless steel chimney manufacturers have made a number of different changes, which have their pluses - minuses. 1. Increasing the thickness of insulation from 25 - 30 to 50 mm per side. Plus - improving fire safety. Minus - a price increase and the overall diameter of the chimney. Exit - to increase the thickness where necessary (sleeve in the passage of the dangerous section). The thickness of the insulation of 25-30 mm is sufficient for normal operation of the chimney. 2. Replacing the continuous weld on the spot. Plus-depreciation due to lack of argon welding. Minus - to apply for gas appliances with atmospheric traction and unwanted use of the equipment with forced injection, as well as solid hardware (the ability to break the spot weld the thermal expansion of metal). Output is obvious: choose a solid or spot welding based on the terms of the chimney. 3. Using a metal centering rings and a metal mesh, reinforced insulation. Plus - a substantial relief mounted chimney. Minus - significant heat transfer at the joint (reducing the temperature difference inside and outside the pipe), the increased cost. Output - for ease of installation can be specially processed edge. 4. Manufacturing of the casing (outer tube) made of galvanized steel. Less - reduction in durability of the assembly.